1. 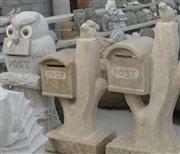 Available Material: Granite, limestone, sandstone, marble, etc. 2. Available Colors: Gray, white, beige, black, yellow, pink, red, etc. 3. Size: It can be customized according to your design. 5. Surface processing: flamed, bush-hammered, tumbled, polished, honed, chiseled, etc. 7. Price: Depends on the quantity and materials. 8. MOQ: Small trial order is acceptable. 9. Payment: By L/C or By T/T, 30% down payments, and balance 70% should be paid after faxing the B/L, and the original B/L will be delivered against the balance. 10. Delivery Time: About 4 or 5 weeks after 30% deposit is received. 11. Other service: If you need, we can help in designing. Hand carver solid columns are available and easy for our carvers. Please contact us for more information.